The Macintosh Bible (Mac Bible) has been around since the early days of Macintosh. I read an older version (maybe 5th edition or so) when I first became interested in Macs, and enjoyed it. 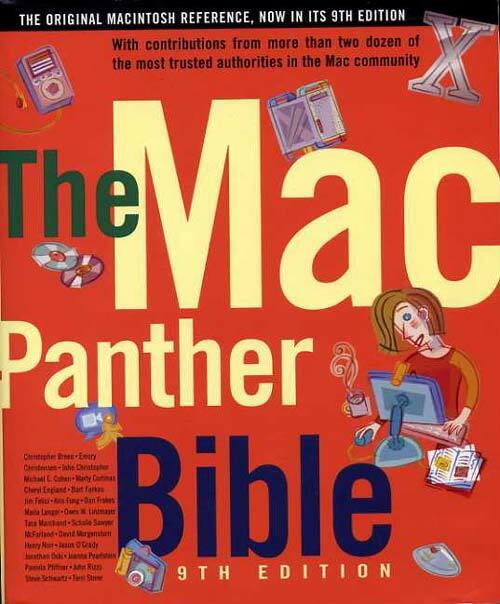 The ninth edition of the Mac Bible is updated to reflect the new features available with Panther (Mac OS X version 10.3). I used two criteria to evaluate this book: basic information and entertainment value. Under basic information I was looking for comprehensive coverage of Mac OS X and current hardware. And, under entertainment I was looking for writing style in general, and looking forward to reading the interviews in particular. The Mac Bible barely met the first criterion and failed to satisfy the second. In the end, I found this book to be very unsatisfying; I would not recommend it. I expected a “bible” to provide thorough coverage across the entire spectrum, with enough depth to answer basic questions. However, I found the Mac Bible to be very uneven – some areas were discussed in relative depth, and others were completely overlooked. For example, the different image formats were enumerated in chapter 13, as were audio formats in chapter 17; but Internet security and firewalls are never mentioned, other than a paragraph on content filtering. The index seemed to share the same variance in the thoroughness. I understand that the book has different editors for each chapter, but the result is less that satisfying. I think that iLife is a key element of the Mac OS X experience, but it was basically ignored in the book. Sure, there is a chapter called “Digital Life” but it deals with each of the iApps separately – iPhoto under photo editing, iMovie under video editing, etc. The book really doesn’t address how the iApps interact. The integration of the iApps makes iLife much more than the sum of its parts, but the book misses out on the concept! The book has several chapters that are presented as surveys of current software available. Part 2 deals with office applications and suites. The only two suites discussed are Microsoft Office and AppleWorks. What about ThinkFree Office? Or the cross-platform StarOffice/OpenOffice suite? I think that these surveys of available applications made sense in the pre-Internet days, but a quick search of the Apple Store Web site provides better coverage of these topics today. I understand that entertainment is a strange criterion for a computer book, but I want to enjoy what I’m reading – I don’t want it to be a chore. Well, the tone of the Mac Bible is fairly conversational; it isn’t overloaded with jargon (except where required). But the interviews scattered throughout the book were very disappointing. None of the interview topics related to the rest of the material in the chapter, and none of the distinguished folks interviewed had anything to do with Mac OS X! The net result was that the interviews seemed like filler instead of insight into Mac OS X. Overall I cannot recommend this book to anyone. It is very uneven, poorly integrated and seems to rely on quantity of pages rather than quality of information as its selling point. I think new users would be better off buying Mac OS X, the Missing Manual by David Pogue and more advanced users should look at Running Mac OS X Panther by James Duncan Davidson. These books will provide a much more satisfying reading experience.